None of the bodies depicted in the photograph were identified. Villagers from nearby, who were initially surprised at the sheer number of corpses in the dakhma , proved unable to recognize the bodies. The corpses also do not match the descriptions of the missing people. There were no animal expect for maggots and files. Zoroastrians rely on birds such as buzzards to dispose of the bodies in the belief they are contributing back to the Earth. Officials found the corpses relatively untouched by any sort of animal. The deep pit in the center of the photograph was filled with several feet of festering blood, Far more than the bodies on the outside could ever supply. The stench was so unbearable many of the officials began to get nauseous when they first approached the dakhma. The expedition was ended when a villager accidentally kicked a small bone into the pit, penetrating the coagulated surface of the pool. A massive burst of gas from the decomposing blood erupted from the pit, splashing those looking into it, along with the photographer. Those caught in the explosion were immediately sent to the hospital where they were quarantined for possible infection. They became delirious with fever, shouting about “being tainted with the blood of Ahriman (The personification of evil in Zoroastrianism)” despite never having admitted they had any familiarity with the religion. In fact, many of them had no idea what the dakhma was when they had found it. Delirium turned to insanity as many began to attack hospital staff until they were sedated, The Fever eventually killed of them. When officials returned with HAZMAT gear the following day, the site was empty . 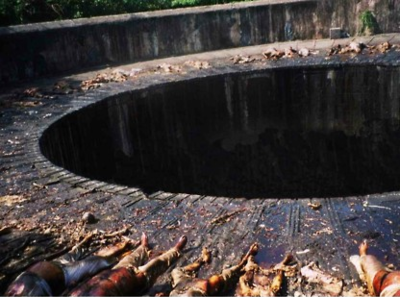 All the bodies had been removed and astonishing, the pool of blood in pit had been drained. All that remained of the incident was the photograph.